Last week at AWS re:Invent 2016, we announced the availability of conversational bots, a new feature on AWS Mobile Hub that enables you to create speech or text based conversational bots in your mobile app. 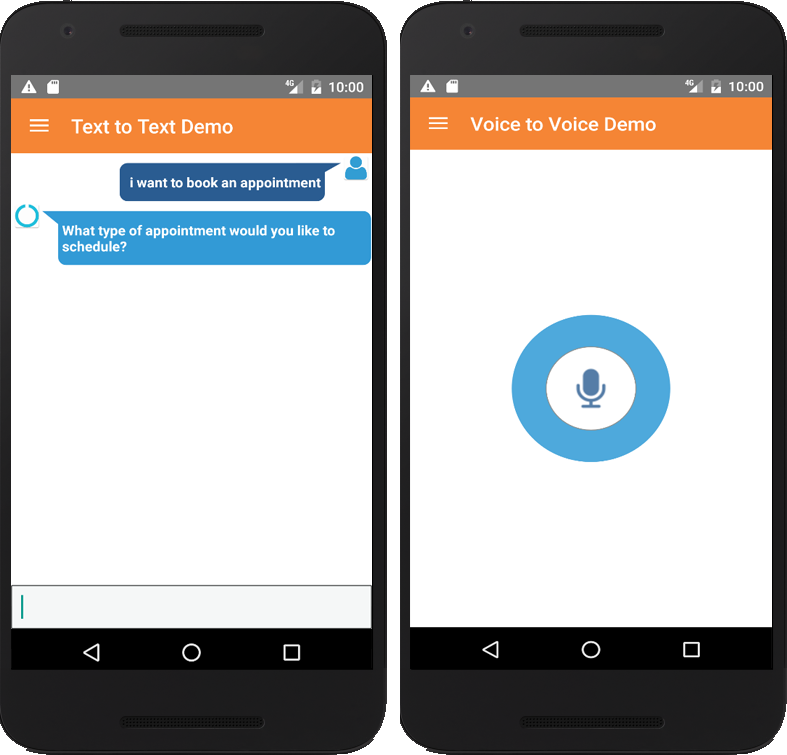 This feature uses Amazon Lex, a new service for building conversational interactions into any application using voice and text. With Amazon Lex, the same conversational engine that powers Amazon Alexa is now available to any developer, enabling you to build sophisticated, natural language, conversational bots (chatbots). Amazon Lex is currently in limited preview. Click here to learn more about Amazon Lex and to request access. With the rapid growth of messaging platforms such as Facebook Messenger and voice controlled devices such as the Amazon Echo, app users are becoming familiar with voice and chat interactions via conversational interfaces. Conversational interfaces, sometimes called ‘chatbots’, understand and communicate using natural language, and provide information or help in completing a task through a series of questions and answers. They provide a more intuitive, efficient way of interacting with applications and devices. · Informational bots to build chatbots for everyday consumer requests, such as accessing the latest news updates, game scores, or weather. · Application bots to build powerful interfaces to mobile applications. Developers can build chatbots that help customers with many basic tasks, such as accessing their bank accounts, booking tickets, ordering food, or calling a cab. · Enterprise productivity bots to streamline common work activities and improve organizational efficiencies. For example, employees can check sales data via Salesforce and check marketing performance from HubSpot. · Internet of Things (IoT) bots to create conversational interfaces for entirely new categories of IoT products, such as cars, devices, wearables, and appliances. Amazon Lex puts high-quality speech recognition and natural language understanding technologies within reach of all developers, in the form of an easy to use AWS service. You supply just a few example phrases and Amazon Lex builds a complete natural language model through which the bot can interact using voice and text. Integration with AWS services allows you to take advantage of the power of the AWS platform for security, monitoring, user authentication, business logic, storage, and mobile app development. Amazon Lex enables you to easily publish your voice or text chatbots to mobile devices, web apps, and chat services such as Facebook Messenger. Once published, Amazon Lex bot processes voice or text input to conduct a conversation with your end-users. As your user engagement increases, Amazon Lex scales automatically so you don’t need to provision hardware and manage infrastructure to power your bot experience. First, request access for your AWS account to be included in the Amazon Lex Limited Preview program. This process might take up to one business day. Next, choose the Conversational Bots feature in the Mobile Hub console in a new or existing project. Select one of the three sample bots and click the Create Bot button. Mobile Hub will create your bot on Amazon Lex with sample intents and utterances. An intent performs an action in response to a natural language user input, while an utterance is a set of spoken or typed phrases that invoke your intent. 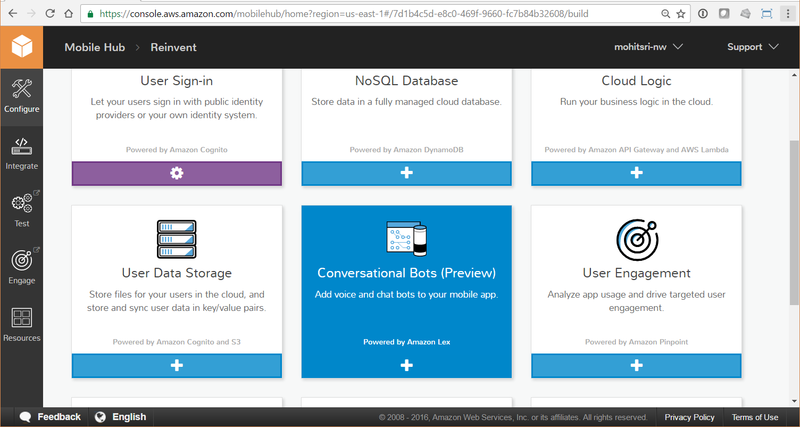 You can learn more about how Amazon Lex chatbots work from the Amazon Lex Developer guide. Once you have created a bot, click the Integrate tab in Mobile Hub. Choose Getting Started on the left navigation menu and then select the platform (iOS Swift, iOS Objective-C, Android) tab that corresponds to your app. Then, choose Download the sample app. We will use Android in this example. The project you download contains working sample code that is generated based on the selections you made. The code integrates with the backend services Mobile Hub provisioned for you. It implements client code to interact with your bot using voice or chat. Unzip the folder and open the project in Android Studio by choosing the project level build.gradle file. Run the sample app in your emulator and try signing up a user. The easiest way to integrate a bot with your app is to follow the integration instructions in the Integrate tab. You can integrate existing bots you have created on Amazon Lex using the Import a Bot option in the conversational bots feature. Ensure you have completed the steps in the Getting Started section. This includes allowing network access, including the AWS SDKs, and copying Hub helper and custom code. Next, choose the Conversational Bots section and follow the step-by-step guidance to copy Android or iOS client code for the voice or text interfaces. So get started today with both these features on AWS Mobile Hub. If you have questions or feedback, please use the comment section or visit our forums.